It has a full-size keyboard so it is definitely not pocketable and a sports a 5.75″ x 1.5″ Mono Liquid Crystal display which shows a “generous” 2 to 6 lines of type. It has a whopping 512K memory. It runs on 3 AA batteries. It has no ability to connect to the internet. Finally, to get “all this,” you’ll have to pay a little more than half the price of a bargain Netbook. No, you haven’t just accidentally stumbled on a review from the Gear Diary Archives. This amazing little piece of retro tech is currently available… and it just might be one of the best digital tools a writer could have. Let me introduce you to… the Alphasmart NEO. The NEO is an electronic keyboard that was created by Alphasmart, a company originally formed by ex-Apple Employees. Their goal was to create rugged devices to teach keyboarding and writing in schools. They have since been bought by Renaissance Learning and are now part of a suite of learning and teaching tech that count 65,000 K-12 schools in the US as clients. The idea seems to have been to create something rugged and without the distractions of a full computer or, later, the internet. 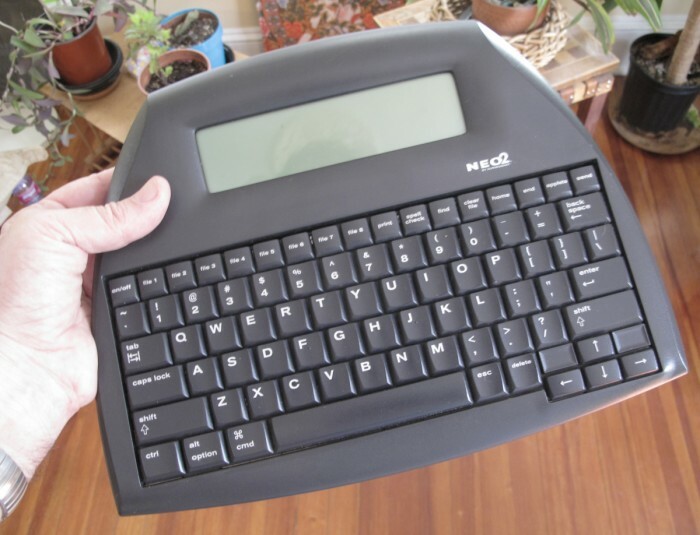 The NEO does one thing and one thing only—it is a typewriter with electronic paper. Oh, and it is not actually aimed at the consumer market. In other words, it was intended for educational settings. A funny thing happened on the way to the Education vertical marketplace, though. Writers started discovering the NEO. And they loved them! And before long a small consumer side-business now called NEO Direct was created. So what exactly is the NEO? The NEO is basic. And that is it’s appeal. It has a full-size keyboard with generous, well spaced, comfortably beveled keys. Even though they aren’t spring-mounted the travel and feel of the keys is excellent with each key press producing a satisfying, but not-too-loud, click. The NEO is not the only device out there that does electronic keyboarding, but there is nothing that comes close to the feel of this keyboard that I have found. The NEO is instant on. Turn it on and the NEO flashes a system screen with a battery meter and you are immediately placed right where you were in your document the last time you used the NEO. Rather than opening a file manager and selecting from a list if files the NEO uses 8 file spaces which are directly accessed by pressing one of 8 keys along the top of the keyboard. It is fast, quick and takes little or no thought. In fact, everything about the NEO seems oriented to get and keep you writing rather than paying much attention to the computer. There are some tweaks you can perform (that’s for another post) but out of the box, it is a lean, green writing machine. The NEO’s screen is small. 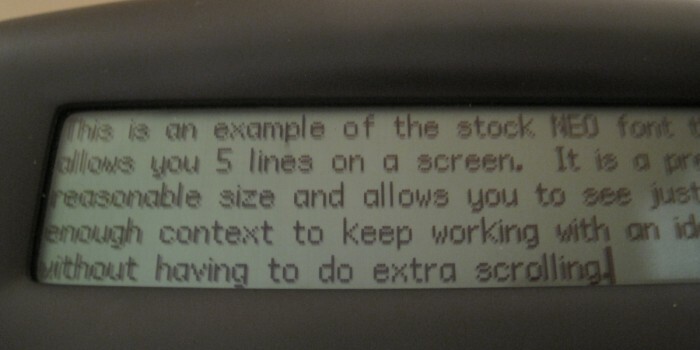 With the included font choices, you can have between 2 and 6 lines per screen. There are some alternative fonts available which can get you up to 11 lines but good (superb) eye-sight is required for those. The screen has no back lighting, but the contrast is sharp enough that you can use it in almost any light. The NEO’s word processing software is simple. The software, Alphaword Plus, includes a spell check, a thesaurus, and all the basic functions like copy and paste and keyboard cursor movement commands, but other than that it is basic. Keep in mind that this is by design, the goal is to get and keep you typing. To make things even simpler, there is actually no need to “save” files. Instead, your work is saved keystroke by keystroke as you type. The 3 AA batteries provide a whopping 700 hours without changing and an internal lithium cell preserves memory even when changing batteries. This means you can take this little writing tool anywhere… even far away from civilization. The NEO has limited connectivity. There’s no WiFi and no Bluetooth on the NEO, but there are several ways to move files from the NEO to your computer. The easiest and most efficient way is to connect the NEO via USB, open up any program that handles text (including, say, a text box in a forum) and hit the send button. The NEO then literally shoots whatever file is open on it to the text area that is currently in focus on the computer, letter by letter, and very rapidly. These days I keep all my writing files in Dropbox so when I write something on the NEO I simply shoot the text into a file on Dropbox. This makes the new text instantly available on all my computing devices. 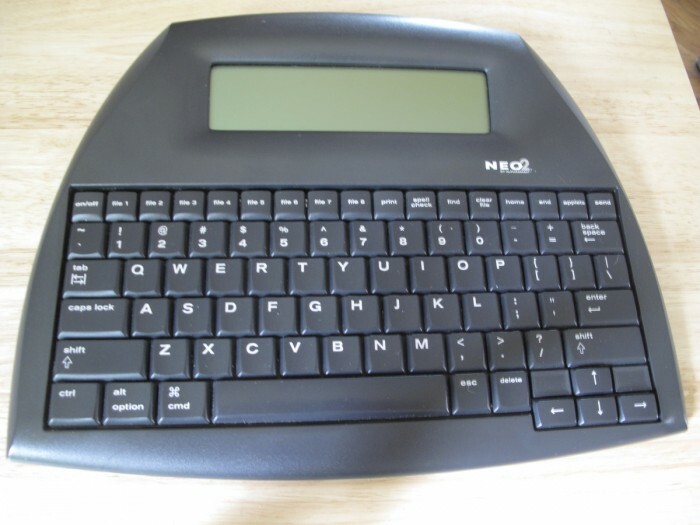 (As a side note, the NEO will also act as a keyboard for any computer to which it is connected). Finally, you can use IR to beam files if you have another device, like an old Palm TX or older Nokia, with an IR sensor. You can supposedly print directly from a NEO to a USB printer, but I have never had much success. What the NEO does and doesn’t do. The NEO can be used in many ways, but ideally it is a draft writer. The reason it is beloved by writers is that it provides the single focus of a typewriter in something very light and portable, which also has digital output. With the NEO there is no computer interface you need to wrestle with which means there is no internet… or media… or games to pull you off task. You don’t even have to watch a battery meter. There is just the writer and a flow of words. At its best, the NEO isn’t even there. And since it is on instantly if you are struck by inspiration you are good to go. The NEO is not an editing machine. Personally, for editing, I want a big monitor with two pages on the screen at once. When I have my editing hat on, I need to see the big picture. Short of spell checking a document, you are not going to want to do much editing or even formatting on a NEO since it is like viewing your words through a keyhole. The screen gives you just enough to keep your thoughts going or remember what was going on when you left off, but not much more without a lot of scrolling. Editing isn’t its forte, but for getting words flowing out of your head and onto the electronic paper, there is nothing like a NEO. The NEO is light weight. Why pay about $170 for a NEO when you can get a full Netbook for about $300, sometimes less? If you have to ask, then you probably don’t need or want a NEO. The NEO is defined as much by what it strategically can’t do as by what it does so well. If your main goal is to be productive at writing, this wonderful machine may help. If you have tried to write a novel but found yourself surfing the internet more than writing, you will appreciate the way in which the NEO can let you write distraction-free. While the NEO doesn’t fit in a pocket, the combination of being very light weight (1.75 pounds), very durable and having long battery life means you can take the NEO with you anywhere and use it at a moment’s notice. So why the NEO? Simple! I’m a firm believer that work goes better with the right tools. I’m willing to pay for a quality, task specific tool even if a Swiss Army Knife might do the job too. For draft writing, the NEO is the right tool… at a premium price. The Alphasmart NEO is available from NEO Direct.